Explore our wide range of programs for businesses below, and find out how you can offer Starbucks in your office, in your operation or as a gift. Starbucks Branded Solutions delivers the Starbucks Experience through business development, relationship management and selling our continuum of brands in Licensed Store, Foodservice and Office Coffee Channels. Create a more complete coffeehouse experience with a Starbucks store at your retail or foodservice location. Discover how you can qualify to own and operate a licensed store. With Starbucks Branded Solutions, you have access to the full We Proudly Serve Starbucks Coffee product portfolio, including Tazo™ teas and Fontana™ premium syrups and sauces. Explore to see how other operators are benefiting from their We Proudly Serve program. Already have an account with us? Log in to place orders, download recipes, and watch training videos. Keep employees, clients and guests satisfied with freshly brewed coffee and beverages in your office. Starbucks® coffee, Tazo® tea, hot cocoa and other delicious products are available for delivery to businesses large and small. 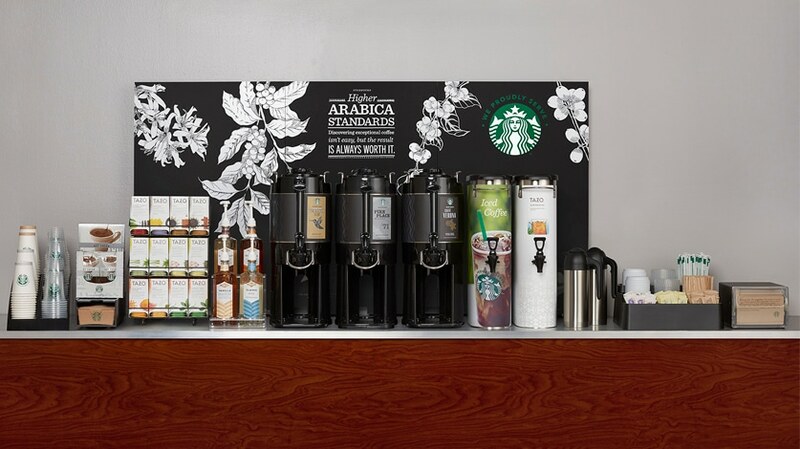 Learn more about Starbucks Office Coffee services. Say thanks with a Starbucks Card – a warm and wonderful way to show your appreciation for clients, colleagues and employees.